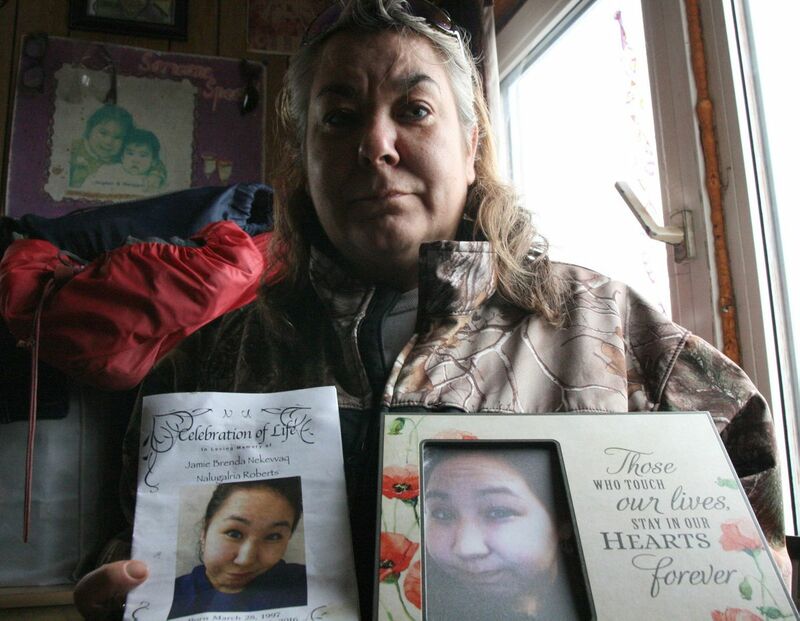 Phyllis Roberts of Quinhagak on Sept. 15, 2016, shows a photo of and the memorial service flier for her daughter, Jamie Brenda Roberts, who died a month earlier of a heroin overdose in the Southwestern Alaska village. Two Quinhagak men have been charged with manslaughter and felony drug charges connected with the 2016 overdose death of a woman in the western Alaska village. James Friendly, 29, and Christopher Tom, 41, were arrested Tuesday, the Department of Law's Office of Special Prosecutions said in a statement. Tom is charged with manslaughter involving a controlled substance and a single felony drug distribution charge. Friendly, 29, is charged with manslaughter and four counts of felony drug distribution. Four people in Quinhagak overdosed on a batch of heroin mixed with powdered fentanyl in quick succession on Aug. 15, 2016. Jamie Roberts, a 19-year-old recent high school graduate, died. The three other people survived. Neither Friendly or Tom have a serious previous criminal record. The case is being prosecuted by a new statewide drug enforcement prosecutor position in the Office of Special Prosecutions, Katholyn Runnels. Manslaughter charges in drug overdose cases in Alaska are rare. "It does not happen too often," Runnels said. In 2015 Anchorage man, Sean Michael Warner, was sentenced to 18 years in federal prison for fatally injecting a 14-year-old girl with heroin at her request. In 2016, a Soldotna man was charged with manslaughter for selling methadone to a overdose victim the night he died. And in 2017, a Kenai Peninsula man was charged with manslaughter for selling his roommate at a sober living house his prescribed fentanyl patches. Tom and Friendly are being held at the Bethel jail.